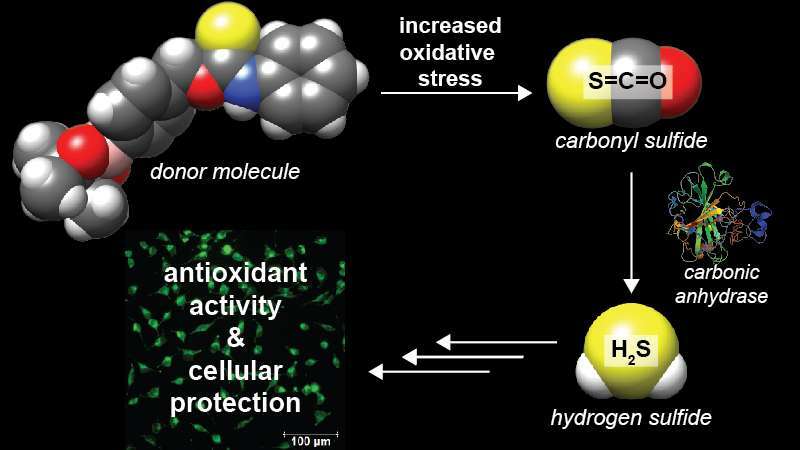 The research - done at a cellular level in the lab and far from medical reality - involves the design of organic molecules that break down to release hydrogen sulfide when triggered by specific conditions such as increased oxidative stress. Oxidative stress damages cells and is tied especially to heart disease and cancer, as well as Alzheimer's and Parkinson's disease. Separate portions of the research were detailed in proof-of-concept papers in the Journal of the American Chemical Society in June and in November in Angewandte Chemie, an international journal. "We have discovered that small organic molecules can be engineered to release a molecule called carbonyl sulfide, which is the most prevalent sulfur-containing molecule in the atmosphere, but more importantly converts rapidly to hydrogen sulfide under biological conditions," said Michael Pluth, a professor of chemistry and co-author on both papers. "We developed and demonstrated a new mechanism to release small molecules that provide therapeutic hydrogen sulfide." Hydrogen sulfide, a colorless gas, has long been known for its dangerous toxicity—and its telltale smell of rotten eggs—in the environment, but it also is produced in mammals, including humans, with important roles in molecular signaling and cardiac health. Initially, Pluth's doctoral student Andrea Steiger, lead author of the ACS paper, used benzyl thiocarbamates to design responsive organic molecules that release carbonyl sulfide. For the second paper, postdoctoral researcher Yu Zhao, also in Pluth's lab, adapted the molecule so it remains nontoxic and stable until cellular conditions trigger it to release the carbonyl sulfide, which is converted to hydrogen sulfide by carbonic anhydrase enzymes in the body. Finding a way to generate restorative hydrogen sulfide in the body has been a goal of many research labs around the world in the last two decades. Researchers in Pluth's lab in 2013 developed a probe that detects the gas in biological samples, providing a framework to test potential donor molecules, either synthetically produced or isolated from natural products. "To do that we need to develop new chemistry," Pluth said. "We are synthetic chemists. We make molecules with the goal of developing new research tools or therapeutic tools. As for treating a disease, we aren't there yet, but these cell-based studies suggest that those types of protective effects might be possible." During a heart attack or loss of blood flow, for example, increased levels of reactive oxygen species like hydrogen peroxide emerge, Pluth said. The recently developed donor molecules are programmed to react to the overexpression of reactive oxygen species. Current hydrogen sulfide donors are generally slow-release molecules that donate hydrogen sulfide passively. Taken together, the two studies show that it's possible to build molecular scaffolds to release carbonyl sulfide and then hydrogen sulfide by creating a trigger in the molecule to start the delivery process, Zhao said. "With this, you might be able to pick molecular events that are associated with conditions in which hydrogen sulfide might be beneficial, and then develop donor molecules able to deliver hydrogen sulfide under those conditions," he said. "The novelty for us was being able to use carbonyl sulfide as a source of hydrogen sulfide donation," Steiger said of the findings of the project she led. "This was a first. It opened up a whole new class of donor molecules." One of the goals of developing these small hydrogen sulfide-releasing molecules is the potential for long-term applications in therapeutics, Pluth said. "Having researchers nearby who are focused on translating basic science discoveries into market applications would facilitate further expansion of this work," he said. Advancing such basic research is the goal of the UO's Phil and Penny Knight Campus for Accelerating Scientific Impact. The $1 billion initiative to fast-track scientific discoveries into innovations that improve quality of life for people in Oregon, the nation and the world began with the announcement in October of a $500 million gift from the Knights. Water (H2O), CO2 AND The GREATEST Microbes that Showed us The Way To Gene-Edits! IT IS HIGH TIME that We Switch from Agriculture in Soil TO The Just Mentioned COMBO to get OUR Starch, Cane Sugar! (CARBOHYDRATES). Then Switch ALL Agriculturists To The GREATEST Universities!